Visit our pages to see how we can serve you! Parts and Service make up a large part of our business as well, helping you get your equipment up and running again is just as important to us as it is to you! The ability to provide parts for all manufacturers with the addition of Pumper Parts and DSO Sanitary Pump Parts give us the ability to get you what you need, when you need it. Visit our contact us page to ask us about anything you may need! Pumper Parts: Parts for Wilden, ARO, and Yamada pumps. See what Pumper Parts you can use by clicking here! 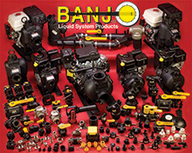 Banjo Liquid Handling Products: Industrial grade glass reinforced injection molded Polypropylene Components. Perfect for Industrial Chemicals, Inks, Paints, Coatings, Acids, Solvents, Corrosives, Pharmaceuticals, Pulp, Soaps, Detergents, Alkalis, Fertilizers, Pesticides, you name it, Banjo has you covered! View all the different piping and fitting options from Banjo HERE! Pump Repair and Parts: For all makes and models of centrifugal and positive displacement pumps including onsite service and mechanical seal replacement. Meter Calibration: On site and shop calibrations of all types of liquid flow meters.